Argentine ants living in vast numbers across Europe, the US and Japan belong to the same inter-related colony, and will refuse to fight one another. What's more, people are unwittingly helping the mega-colony stick together. Argentine ants (Linepithema humile) were once native to South America. But people have unintentionally introduced the ants to all continents except Antarctica. These introduced Argentine ants are renowned for forming large colonies, and for becoming a significant pest, attacking native animals and crops. Researchers in Japan and Spain led by Eiriki Sunamura of the University of Tokyo found that Argentine ants living in Europe, Japan and California shared a strikingly similar chemical profile of hydrocarbons on their cuticles. But further experiments revealed the true extent of the insects' global ambition. 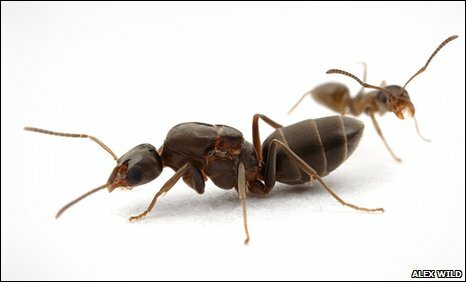 The team selected wild ants from the main European super-colony, from another smaller one called the Catalonian super-colony which lives on the Iberian coast, the Californian super-colony and from the super-colony in west Japan, as well as another in Kobe, Japan. They then matched up the ants in a series of one-on-one tests to see how aggressive individuals from different colonies would be to one another. Ants from the smaller super-colonies were always aggressive to one another. So ants from the west coast of Japan fought their rivals from Kobe, while ants from the European super-colony didn't get on with those from the Iberian colony. The most plausible explanation is that ants from these three super-colonies are indeed family, and are all genetically related, say the researchers. When they come into contact, they recognise each other by the chemical composition of their cuticles. "The enormous extent of this population is paralleled only by human society," the researchers write in the journal Insect Sociaux, in which they report their findings. However, the irony is that it is us who likely created the ant mega-colony by initially transporting the insects around the world, and by continually introducing ants from the three continents to each other, ensuring the mega-colony continues to mingle. "Humans created this great non-aggressive ant population," the researchers write.